"If you’re looking for a local, reliable and trusted roofing company in your area then look no further than Liberty Roofing! We’ve been providing residential and commercial roofing services for over 35 years"
Liberty Roofing carries out professional roofing repairs and servicing for residential and commercial customers throughout the Utah Valley / Salt Lake, at a time that suits you. Our expert, qualified, insured and friendly roofing techs will arrive and complete their work promptly, allowing you to get on with your day. Inquire online or call us now to schedule your repair appointment. "We guarantee our workmanship by using only the best materials and working with the best roofers in the business. We stand behind our work with a 10 year warranty for our labor and extended warranties on all materials. That is twice as long as many of our competitors!" Dave Hemmert, Owner - Liberty Roofing Inc.
We at Liberty Roofing have all the experience and know-how to help you put the pieces together to find the perfect new home roof you’re looking for within your budget. Whether it is an entire rain gutter system or leaf protection only, our reliable installers will create a custom fit solution backed by industry leading warranties. As one of the most trusted residential roofing repair services out there, you can relax knowing your roofing repair will be done right, the first time, with Liberty Roofing. Liberty Roofing installs ridge vents, soffit vents and attic fans to save you seasonal heating and cooling expenses and to protect the integrity of your home roofing system. From natural materials like slate to man-made products such as asphalt, & plastic polymers, there are more types and styles of roofing to choose from today than ever before. Planned Roofing Maintenance helps you avoid unexpected budget and roofing issues, facility downtime and premature roof failure or replacement. Celebrating 35 years in the business! 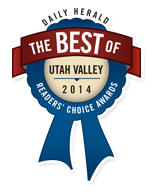 Covering the complete Utah Valley including Provo, Salt Lake City, Sandy, Wasatch Front, and all of Utah County. Liberty Roofing offers an incredible selection of roofing services for commercial and residential properties. No matter what type of work you need done, you can trust our skilled roofers to do the job right. Liberty Roofing remains a locally, family owned company who gets to know each of our customers. This is a mutually beneficial situation; you want quality, long-lasting roofing installation and replacement, and we strive for long-term business relationships. We want to prove our value with every task, no matter how big or small, and whether or not you’re a first-time customer or a member of our family. Choose a family-run roofing company you can trust. Liberty Roofing knows how to do a job and do it well! Without jeopardizing the cost or workmanship!! I’m a contractor as well, and I’ve seen cheap work and highly priced work! You usually you’ll get a better job for more money, and not so great of a job for less! Liberty Roofing did a great job for a reasonable price! Liberty Roofing will definitely be referred by me! Thanks for the great job! Liberty Roofing had a very competitive bid. When the project was started, we were concerned about rain, so his team made an extra effort to complete our roof in stages and make sure it was quickly covered with the waterproof material. High quality roof at a fair price. We would recommend Liberty Roofing! I needed a complete roof tear off and replacement. The previous roof was not properly installed and had been a problem for years. Every big wind meant lost ridge caps and shingles. Liberty Roofing gave me the best bid and the workmanship was excellent. I could immediately see the difference with the new roof vs. the old. They answered all of my questions with patience and were very professional. Several of my neighbors have used Liberty Roofing for roof replacement and others have asked for bids. They must be doing something right.